It is with her commitment to a lifelong, organic process that Jenny Nelson has achieved what so many artists and creatives work for; a language and a technique that is very much her own. She has wooed audiences here and abroad with consistently exquisite and balanced abstract paintings in neutral palettes of blues and grays that give way to pops of pink and orange. But to pin her as solely an abstractionist would be limiting her skill and versatility as a painter. 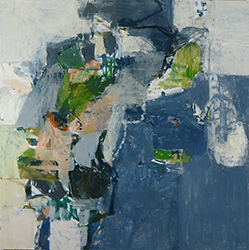 Classically trained at Bard College, Nelson’s thorough knowledge of composition and color relationships as experienced through drawing from life are the tools that prepared her to work in abstraction and develop her technique. Nelson begins all her paintings the same way; she mixes an extensive palette of colors, preps the square canvas, and goes to town obliterating the surface with lots of color and wild gestures using oil sticks and brushes. After sitting with the discomfort and rawness that remains, Nelson turns the canvas around and around until a shape or color comes to the foreground. The next step is reductive as she blocks out bits of chaos with a solid color applied with a palette knife, oil sticks and brushes. Tension is built through the push and pull of paint as it is layered over colors and unruly forms. Nelson studies the painting at all stages of this process, waiting for it to communicate the next step until harmony and balance is achieved. Each work, with its own identity demanding attention and complete surrender to the process, may seem daunting at the onset. But Nelson is comforted by the perspective that painting is infinite and each new canvas is just one of many, therefore easing her expectations. Some pieces in this new body of work differ from previous paintings in that the abstractions are once again rooted in life. Inspired by the photographs of artist Joseph Podlesnik, Nelson uses his architectural and observational compositions as the framework for her new work. While the origins of the photographs’ subjects are not recognizable in the finished painting, she channels the energy discovered in his real-life findings to her canvas for a result that is entirely abstract. Invigorated by this approach, Nelson bravely moves forward, prepared to shift genres if that is where her journey takes her. A graduate of Bard College, Jenny Nelson also studied at the Lacoste School of the Arts in France and Maine College of Art. She completed a Residency at Byrdcliffe Art Colony from 2004 – 2008 and has exhibited regionally and nationally for many years. Nelson currently teaches workshops and an ongoing weekly class at the Woodstock School of Art. Christopher Engel will feature work that spans ten years of the artist’s oeuvre. Throughout this period, a close examination to space and form remains at the heart of Engel’s paintings while geometric formations of color loosen into sweeping gestural brushstrokes in later years. With canvases over 4ft tall, broad arcs and linear applications of paint propel Engel’s foreground against a subdued background, where the artist achieves a mindful spatial perception. “Space is something ever present”, he states, “even in total darkness we are conscious of space around us. I try to achieve this feeling with color, texture, overlapping shapes and scale.” As minimalist shapes transform into expressionistic gestures Engel maintains a palette of earth tones and forest greens undoubtedly informed by the artist’s rural studio landscape. Germantown, NY based artist, Stephen Walling, returns with three-dimensional wall sculpture of colorfully painted wood strips and blocks, intricately carved and composed into graphic arrangements. After a successful career as an art director at Conde Nast and experience in crafting handmade furniture, an inclination for sculpting came naturally, and now the artist continues to awe viewers with his abstract creations. While continuing his affinity for bold color and shapes, Walling has presented more complex constructions in his latest work, choosing to develop the strips of wood with elaborate carvings and additional tiers that encase hints of color like a hidden gem. The surprises are all in the unexpected details; a shade of bright yellow that peeks through the pale blue box-like constructions in “Let the Sunshine In”, or varying shades of bright green painted into the crevices of a sleek, white, vertical composition in “Glimpses”. Walling weaves playful sensibility with intrigue into each work, offering multiple perspectives that change depending on how you look at it. A series of abstract sheet metal paintings by Bruce Murphy will also be on view. Traditionally an artist whose material of choice is paper and canvas, Murphy presents unconventional methods of painting with this body of work from 2012. Never failing to present beautiful possibilities in abstraction, the artist combines delicate applications of yellow and mauve that dance against a natural rust surface behind a glossy veneer. Each painting in Juan Garcia-Nunez’s evocative new “Transparencies” series draws the viewer in with a bold, geometric silhouette along the vertical axis, a clever experiment in positive and negative space that conjures up a variety of possible identities: an abstracted landscape, an eclipse, an abyss—each viewer will understand the image in their own way. These silhouettes flare out in a beautiful array of warm scarlets and ochres, fading gently into the more subdued background. As with his past work, Garcia-Nunez’ simple, symmetric approach to composition, softly layered application of watercolors, and attention to atmosphere in his painting once again provide a glimpse at the sublime. Joe Wheaton’s sculptures are a static moment in an active performance. If Calder and Miro had a love child, Wheaton would be him. The group of oxidized brass pieces have qualities of both surrealism and post-minimalism and confirms Wheaton’s craftsmanship in the gracefulness of his work. There is also an interesting dialogue between the form and its shadows that are cast onto the gallery’s white walls. On view in the upstairs gallery will be the aerial photographs of pilot and photographer, John Griebsch. Griebsch’s series “Aerias”, which consists of over 300 photographs (and counting), quite literally makes molehills out of mountains. Photographing the Earth from the vantage point of his 1952 Cessna 170B, Griebsch’s subject matter consists of patchwork farmland, interlaced winterscapes, and even an Auburn, NY landfill. And the work doesn’t lack for artistic merit, either; viewed from up high, fractals in nature call to mind a Pollock painting, while swirling rivers echo the brushstrokes of Van Gogh. Complimenting the Earth’s natural majesty is Griebsch’s mature and keen sense of composition, gained from a photography career that began at the age of 12. Since then, his work has been exhibited nationally and is included in over a dozen corporate collections.